Bogart never flicked a Bic. He pulled out one of these lighters to make an impression on his leading ladies. 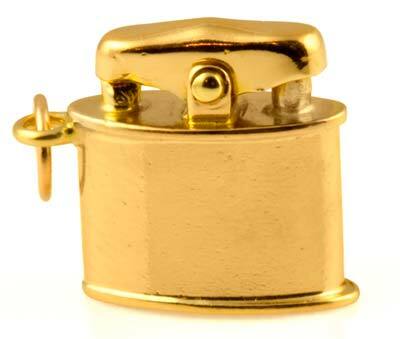 Now you can wear this cool 14K cigarette lighter charm on your bracelet. While I've seen a number of lighter charms over the years, this one is a keeper. The bar on top moves, making this a true "mechanical" charm from the '50's or '60's. Tests 14K. 12.2mm (0.48in.) high. Weight 1.8 grams.